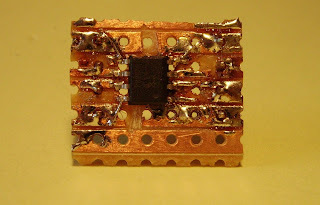 The principle is simple enough: the prototype tracks are twice as wide as the pads on the chip, so cut then in half lengthways and use fine wire (or judicious application of solder) to connect the chip's pins to the header pins. 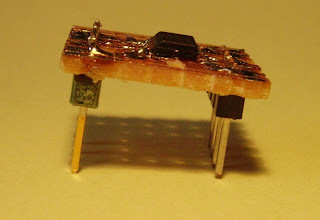 The result is a unit which can be plugged into a breadboard. 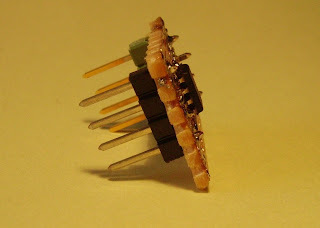 This approach is great for 8 pin devices, however a different approach is required for anything bigger - more on this later when I have to wire up a 16 pin device. How did you manage to cut the copper track without it all coming off? With a sharp enough knife you can cut the outline of the section of track you want to remove. Then with the knife almost horizontal push at the corner of the section and slowly lift up just that small section of track. I didn't experience any problems with track lifting off, except when introducing the soldering iron to very short pieces of track. I'm still shocked at how much dedicated adapters cost, even for small packages. Sometimes if you heat trackboard too much it melts the glue that holds the copper to the mica or whatever it is, causing it to lift off.